You’ve tried it, haven’t you? You’re one of those 33% of people who orders it on a flight from time to time. Maybe you even order a second glass. But what makes tomato juice so alluring on board? I can’t say I’ve ever quite understood it. I was situating myself with a magazine in seat 24B on a recent trip to Berlin when the drink cart was unveiled from behind the curtain. If you’re like me, this is your favorite part of a flight; indulging in sparkling sodas I normally steer away from at my local supermarket. Inconspicuously surveilling the drink cart from behind my magazine as it came down the aisle, I watched in awe as the tomato juice phenomenon claimed its victims. It seemed like every third passenger was ordering the stuff. The elderly lady with the round glasses was ordering it, as was the burly bodybuilder type in the window seat in front of me, and a whole family three rows ahead followed suit as well. When the guy next to me also ordered one (extra pepper), I decided to get to the bottom of this once and for all. I’ve heard several theories why tomato juice is such a hit on planes. One attributes it to the juice’s high nutritional value and filling-effect, another writes it off as an imitation effect, or desire to keep up with whatever beverages are in high demand or trendy at the moment. Unfortunately, there is little evidence to back up these claims. 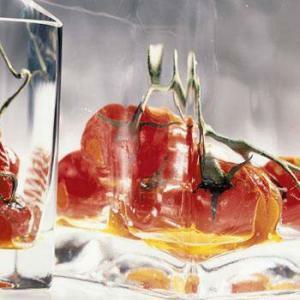 To shed some light on the tomato juice mystery, I decided to take the question to the Web. 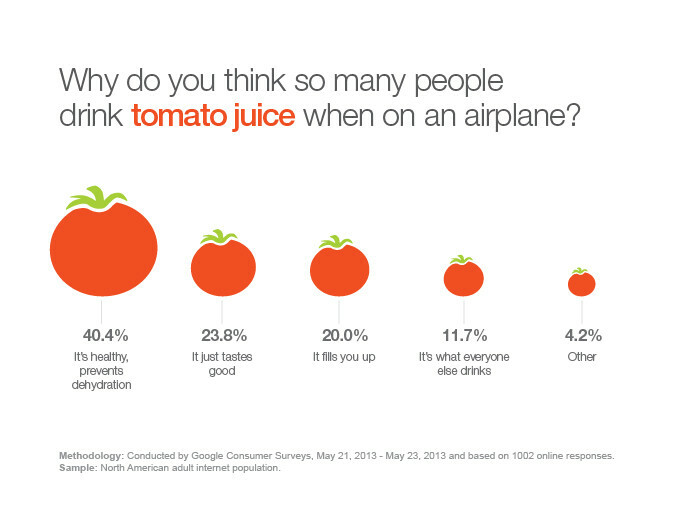 I conducted an online surveyed asking “Why so many people drink tomato juice on airplanes”, and received over 1,000 responses. The answers were surprising, and showed that a majority of people consume the juice for its nutritional value and hydrating effects, while only a few attributed their consumption to an imitation effect or trend. Other interesting feedback from the survey suggested tomato juice works great as a Bloody Mary or may help prevent motion sickness. In the end, I realized that there’s no way to say for sure why tomato juice is such a hit on board; every person drinks the red juice for one reason or another. But whatever your reason to drink tomato juice on your next flight, I hope you enjoy it!